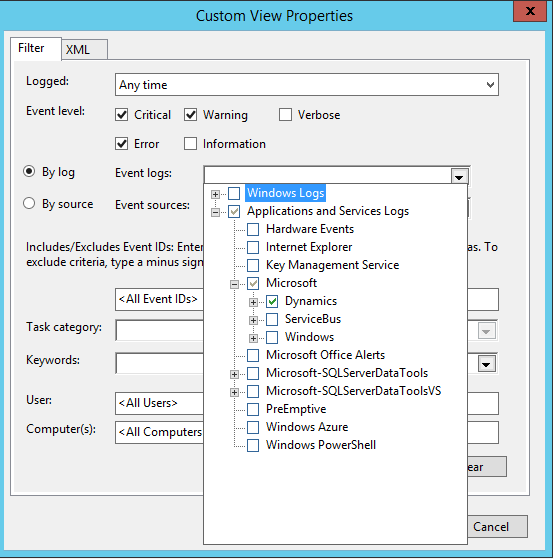 Looking for AX/Retail errors in the EventLog but do not know where to look for? Custom Views/Create new custom view. Select Event levels you want to see. Hit OK and call it “Dynamics”. Author Andreas HofmannPosted on September 12, 2016 Categories AX 7, AX 7 RetailTags AX7, Retail Sdk, RetailServer, RetailTransactionServiceLeave a comment on Looking for AX/Retail errors in the EventLog but do not know where to look for? This video demonstrates how to store application settings securely and manage them in AX. These settings are needed for AX business logic and CommerceRuntime business logic. The data is fetched via a RetailTransactionServiceEx call. The CommerceRuntime service takes care of calling the RTS and caching for a configurable period. Video also shows how to test this by exposing it via RetailServer and using the RetailServer TestClient.